HomeMarketing News & AdviceTipsBeware of vanity metrics! Are you effectively measuring your social media results? If you are anything like me, you can spend hours falling into the digital blackhole that is social media. I’ve spent hours scrolling, liking, commenting and posting to build up relationships with future and existing clients. But how do you know if all this precious time is actually worth while to your business. An important question to ask is ‘Is your time on social media helping you to achieve your overall business goals and therefore an efficient use of your time?’. This is where measuring responses to your social media activity helps to prove the return on investment. Before you step into the magical world of social media you should have a very clear goal of what it is you would like to achieve, and this goal should be aligned with your overall business or marketing objectives. As well as being goal orientated you must make sure that you are posting meaningful content. This is content that is either helpful, interesting and/or entertaining to your followers and potential customers. Without the right content measuring the outcomes is meaningless, because no matter how many engagements you have had it will not have helped push your business forward or build up the relationships you are looking for. So, what is a metric? In some respects, measuring social media results is much easier than other marketing activities such as print advertising or public relations campaigns, however whilst there are lots of numbers available it does not always mean that these are meaningful numbers. 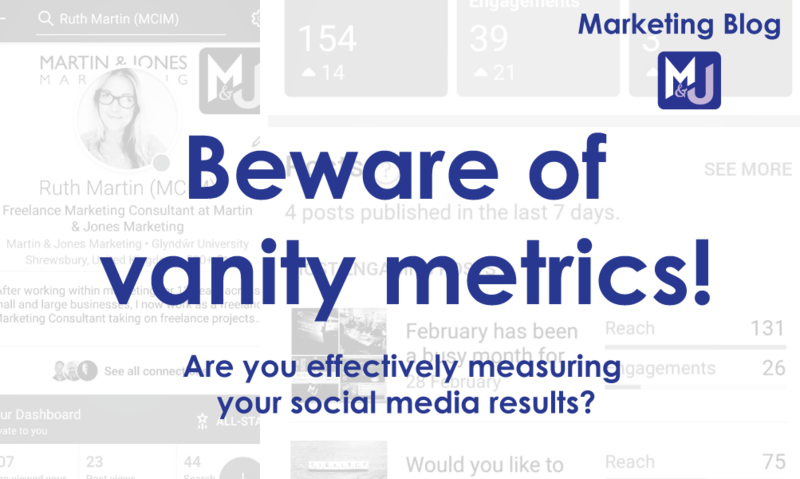 Beware of the vanity metrics! Jodie wanted to use a series of social media posts to get followers to sign up to her blog. She put out her posts and looked at the stats. The post had been viewed by 50% more people than normal – hurrah! However, no-one has signed up for her blog. In this case the goal of the campaign was to get people to sign up to the blog, so the important metric to look at was the sign-up rate. The vanity metric would be the views – they look great but have not achieved the business goal. Now we’ve covered some of the basics we can start to look at some of the specific metrics that are available for us to use. I’ve covered Facebook, Instagram, Twitter and LinkedIn, although I have added some links at the bottom to provide more information on the measurements available in Pinterest, YouTube and Snapchat. Each platform gives its metrics a slightly different name, but many of the words mean the same thing. What does this mean? This is the number of unique accounts that have viewed your post. How does this help your business? If you are looking to increase general awareness of your company, product or service this is a good one to look at. It is called reach on Facebook and Instagram, views on LinkedIn and impressions on Twitter. What does this mean? This is any action that viewers have carried out around your post, such as likes, comments and shares. How does this help your business? Measuring these will really show you if the content you are posting is relevant to your following. The more engagements you have the more your following are relating to your brand and you can build up a relationship with them. What does this mean? A type of engagement. How does this help your business? If people are liking your posts it means they have not just seen the post, but it has resonated with them enough to take (a small) action and to publicly support the message in your post. What does this mean? Another form of engagement. How does this help your business? People commenting on your post is a really good sign. Your post has been interesting, helpful or entertaining enough that your followers want to talk about it. This means you are able to have actual conversations with people and are facilitating people communicating with each other. Comments are also a valuable way of gaining real insight into how your followers think and feel. What does this mean? A function where other users re-post your content. How does this help your business? This shows that you are posting engaging material and will increase the overall reach of your post. This is really handy if you are promoting an event or important information. What does this mean? This is when people have seen your post and then either viewed your profile, page or clicked through to your website. How does this help your business? This is an important metric to measure if the key objective of your social media is to get more people to your website. It shows that whatever you have posted has inspired people to find out more about you. It’s also a good way to start to develop a lead, especially on LinkedIn. It is important that your profiles provide visitors with a clear view of who you are, what you do and how to contact you so you can take advantage of this interest. What does this mean? When you have received a message to your inbox within the social media platform. How does this help your business? If you are looking to get leads directly from your social media activity then this is what you really want to achieve, as it is a customer coming directly to you for information, help, support or to buy. Use this analysis to check that your Instagram following is the same as your overall target audience. This measurement tells you what times your followers are online, so you can post when they are most likely to see. Measuring this is extremely useful, as it displays how many people who have liked or followed your page are signing up to hear more from you. It is a great indicator of how many people are interested in your brand. This indicates how easy it is for people to find you on the platform. There are many more insights, metrics and measurements across all the different platforms, but this will have given you an overview into what can be measured and how it will help you get the most from your social media activity. If you would like to learn more, we offer 1-2-1 training on social media posting and analytics to help you get the most from your time. Just email ruth@martinandjonesmarketing.co.uk for more information. Here’s some helpful articles about understanding social media measurement across all the main platforms.